Brazil is in the midst of a major political change. During the previous presidency of Luiz Inácio Lula da Silva, the Brazilian economy started to crumble. Crime and violence was on the rise, and people became frustrated. This frustration led to the rise of Jair Bolsonaro, the right-wing candidate often compared to Donald Trump. Bolsonaro’s primary campaign promise was the reduction of violence through military expansion. This played well with Brazilians, who in October made Bolsonaro their newest president. Bolsonaro’s most talked about policies have to do with human rights. Bolsonaro is very religious: his campaign slogan was “Brazil before everything and God above all”. Among these heavily religious views, Bolsonaro openly expressed his hatred of LGBT individuals, a view which caused widespread fear and outrage. He also is blatantly racist and is running on anti-democratic policies. His rhetoric has sparked outrage among international news sources and the people in Brazil who do not support him. 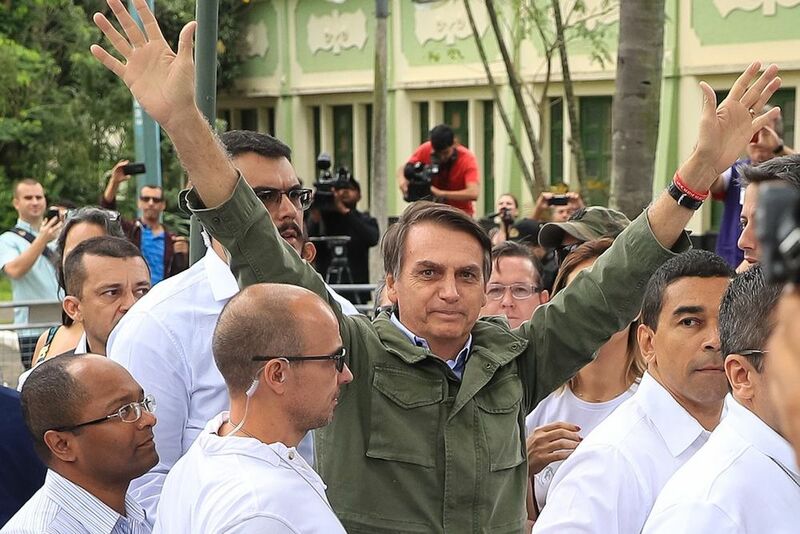 Bolsonaro’s conservative policies do not stop with his anti-human rights views; he supports expanding gun rights, reducing state intervention in the economy, and stepping out of the Paris Agreement. He also advocated for moving the Brazilian Embassy to Jerusalem, a controversial move exercised under US President Donald Trump. Even though Bolsonaro received heavy criticism for his harsh social views, he still had a wide base of support in the election. The high Brazilian homicide rate, totaling 63,880 murders last year, weighed heavy on voters. Bolsonaro’s vote share was likely bolstered by the violence, as candidate Jair promised to reduce the crime in Brazil. Bolsonaro is also running in direct opposition to the Workers’ Party, of which former president Lula was a part of. The Workers’ Party advocated for government welfare and government intervention, but was also known for rampant corruption. Caught in Operation Car Wash, many political leaders from Lula’s party were arrested. The policies of the Workers’ Party did little to improve the economy causing , citizens are turning to the exact opposite: Bolsonaro’s minimal government policy. Brazilians from all backgrounds voted in favor of the new president: Businessmen, attracted to the idea of less government intervention, supported Bolsonaro, as did the Evangelical Christians, who support Bolsonaro for his anti-LGBT ideas. Finally, the Farming Lobby also supports Bolsonaro because of his promise to get rid of corruption and reduce bureaucratic policies. The Brazilian election had 13 candidates, most of which did not gather much support and only polled a few percentages in the first election. The top candidates were Bolsonaro, Fernando Haddad, and Geraldo Alckmin. Haddad ran for the Workers’ Party after Lula was arrested and subsequently prohibited from running. Haddad only had one month of campaigning before the election, and ran on the same Workers’ Party platform as Lula, but with more moderate positions. Alckmin looked very promising internationally: he is part of the Brazilian Social Democracy Party and ran on an economic platform, aiming increase the GDP, create jobs, and create stability in the economy. Brazilian elections do not work in the same way as elections in the United States. If a candidate does not reach an absolute majority, elections go to a second round where only the top two candidates run against each other and a winner is decided with a majority vote. Brazilian law requires all citizens aged 18 and up to vote. After the first round of elections on October 7th, Bolsonaro was in the lead with 46% of the votes, while Haddad trailed with 29% of the votes. On October 28th, the runoff election took place, with Bolsonaro garnering 55.1% of the votes to Haddad’s 44.9%. In an unusal election season, the unusual candidate won what my be 2018’s most important election. Now Brazil must deal with the consequences of their decision. Bolsonaro’s campaign grew strong through the fears of violence and a poor economy, and the people will be expecting change. But that change will come at a cost. Bolsonaro’s brash personality and often untethered ideas may lead to an increase in tyranny and an erosion of civil rights. Bolsonaro’s misogynistic, racist, and homophobic ideas, which grabbed a portion of voters, will be expected by some, condemned by others. How the international community reacts remains to be seen. Bolsonaro is now at the helm of one of the world’s largest emerging markets. Previously foreign leaders had looked to brazil to be a beacon of democracy, stability, and economic growth in a continent where that has historically been lacking. However, Bolsonaro’s campaign of fear changes expectations. Although foreign government can expect some deviation from the ideas of freedom, democracy, and widespread support of human rights, the extent of these deviations will not be fully known until Bolsonaro’s policies begin to take shape when he takes office on January 1st, 2019.